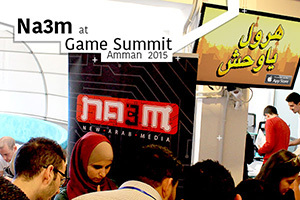 Amman, Oct. 17th- Organized by the King Abdullah II Fund for Development, the 2015 Jordan Gaming Summit joined experts and industry leaders to highlight the kingdom as a successful regional hub for the digital gaming industry. In the presence of representatives of world-renowned companies in the industry, more than 500 developers, programmers, experts, industry stakeholders, school and university students joined the conversation under one common theme, ‘How to Grow’. NA3AM had the opportunity to exchange ideas and expertise, while exploring opportunities to turn our ideas into a reality. We also showcased our products by allowing the attendees to play our top performing mobile games, Nitro Punch and Run Camel Run. At the Gaming Summit, Na3aM witnessed a lot of anticipation and excitement regarding the new Nitro Punch 1.5 update as well as the android launch for the app. We also presented the Saudi Girls Revolution teaser, generating lots of dialogue and enthusiasm. NA3AM is grateful to the Fund for allowing us to collectively empower Arab youth. Our objective to drive and motivate youth to be innovative, while harnessing their potential at this event gave us the opportunity to show the world what makes NA3AM unique!